In times of crisis we give care to all who require assistance. We will bring our experience to the lives of those who wish to remain in their own home by providing choices, respecting your lifestyle and treating your home with dignity and respect. From minimum hours to all hours. The introduction of CDC has sparked many questions, resulting in Care Net making sure that we can deliver what our clients want into the future. Self directed care will allow you the consumer to seek a provider of choice to deliver care to you. At Care Net we can assist you in making these decisions. You may require extra hours outside your existing CDC hours or you may like to choose Care Net as the sole provider of your CDC package. Encompasses a wide range of care services to especially give the family carer an opportunity to �have a break� from their everyday caring role, while their loved one is being cared for by a capable support work. Services are available day or night on request. Helping to continue community access, connect you if you are unsure of how to stay involved in social settings some examples are bowls, library, local caf�, music groups, church, or going for a walk just to name a few. Care Net support workers can come to your home, assist with activities, help access support groups or activities that are important to you. Perhaps you require support with meal preparation, companionship, security of visits, falls prevention, safety and supervision to perform some tasks. Services will be offered to meet individual needs with a flexible approach. Care Net Care Net has company cars available to transport you to appointments, medical or social on a one off or regular basis. Care Net can provide a service to heat and serve a meal pre prepared that has been delivered to you or to shop, prepare and cook one to you liking in your home. As loss of independence results in you needing support at home, Care Net will provide assistance;�getting in and out of bed, moving around the house, medication monitoring, shower/bathing, dressing and grooming toileting, hygiene requirements. Care Net is able to include use of lifting devices such as a hoist. All care is taken to ensure ongoing delivery of the highest quality, while maintaining your dignity and respect at all times. Our aim at Care Net is to assist you to retain your independence in as many areas of domestic activity as possible, housework, and cleaning or general tidying; weekly vacuuming, dusting and laundry are some of the domestic services provided. Care Net brings to the lives of those who wish to remain in their own home suitably qualified support workers to assist with all aspects of daily living, 24 hours a day/7days a week. 24 hour care enables clients the flexibility of choice of their care requirements till end of life. Our support workers can provide assistance with all care needs, activities of daily living; getting in and out of bed moving around the house, medication management, preparing meals, assisting with showering, getting dressed, grocery shopping, social connections, attending appointments with them or simply�having a coffee at their special caf�. Clinical coordinators will help assess your needs. Registered and Enrolled Nurses, with a wide range of skills and experience, who are available to visit for the assessment and management of� nursing requirements such as; post operative care, medication management, diabetes management, continence care, stoma and wound care, post-operative care, risk management, falls prevention and early discharge programs. Care Net supports people living at home with a progressive life limiting illness and we acknowledge that each client has different circumstances and our commitment is to create a support plan that works for each client and supports those close to them in the best possible way. In times of need we will offer care through our experience; working together as part of a specialised team for you, your family and loved ones giving you the opportunity to spend time together in your home at this precious time. Care Net can provide a range of support services to people with dementia to allow them to remain living in the comfort and familiarity of their own home for as long as they and their family choose to do so. We will work together with you to gather a comprehensive history to assess the person living with dementia to feel safe and develop a personal support plan that can include photos boards, scrap books, art or music. Care Net have links and partnerships to support programs offered by Alzheimer�s Australia. Our support workers have current knowledge and can apply skills in understanding dementia and the issues surrounding support and care. Complete orientation and maintain training programs to meet ever changing industry needs. Comprehensive insurances and police clearances cover all our employees. 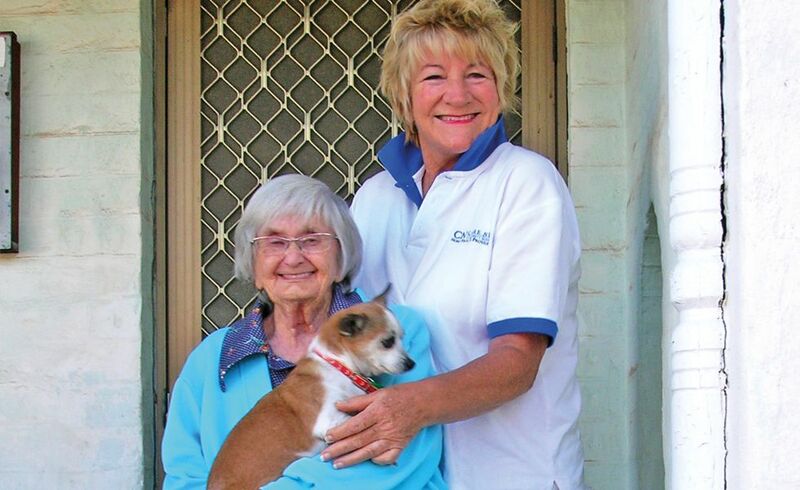 The majorities of our multi skilled support workers have Certificate 111 in Aged Care and are committed to our philosophy of supporting those living at home.